Here are a few more areas I've have completed today. There is some exciting news in the crazy quilting world! 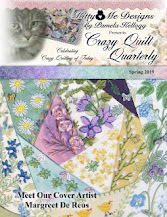 Many of you know that I am a huge fan of the magazine 'Crazy Quilt Gatherings' that Pat Winter has been publishing for the past few years. Pat has just announced that she will be retiring at the end of the year and she will be passing the helm over to Pam Kellogg, starting with the Spring issue in 2015. Both ladies are incredibly talented crazy quilt artists. Pat will be missed, but I know the magazine will be in good hands. Today's quote, from Jonathan Kozol "Pick battles big enough to matter, small enough to win"
Both of these floral patterns are courtesy of Kathy Shaw of Shawkl Designs. Cathy recently gave away a download of several designs for scissor cases to her followers and these are my versions of two of them. btw - if you pop over to visit Cathy, be sure to have a peek at her adorable beaded turtle cabachons!! stepping stones out of stumbling blocks"
I know it's not a great picture (taken through a screen, unfortunately), but this is a beautiful red-tailed hawk, obviously lying in wait for any unsuspecting mourning doves that dared to visit our feeder. From Ronald Reagan.... " God's miracles are to be found in nature itself; the wind and waves, the wood that becomes a tree - all of these are explained biologically, but behind them is the hand of God"
This flower was worked using the waste canvas technique and fills a corner of one of the secions quite nicely. I had to adapt the pattern so it did though. I have shown this area before, but wanted to show you how I have added 'things' around the image. Here I have sewn on a section of a pair of earrings to the lower left of the image (never turn down broken pieces of jewelry because they are goldmines to add interest to your pieces). On the lower right I have added three commercially-made flowers (originally sold as scrapbook supplies) topped with a sequin and bead. You can also see another piece of jewelry right in the corner (part of a necklace). A pair of side-cutters and some sandpaper are definitely something you will want to keep on hand to cut the metal of the jewelry and then sand off the rough edges so they don't become caught in your threads or wear a hole in your fabric over time. I never use glue on my pieces because I feel that it is likely to let go over the years. Everything I use is stitched down. And from Francis Ford Coppola.... "I don't think there's any artist of any value who doesn't doubt what they're doing"
The cross stitch carnation I used on the right is a pattern from 'Donna Kooler's 555 Cross-Stitch Sampler Motifs' book. "Most kids hear what you say; some kids do what you say; but all kids do what you do"
Now it's on to filling in sections!! 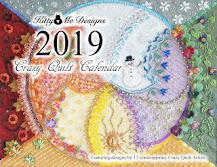 First of all, I would like to let you know that the latest issue of Pat Winter's 'Crazy Quilt Gatherings' magazine is now available for purchase in either print or digital version. You can go HERE for further information and to order your copy. "Don't shop when you're hungry,"
It's perhaps difficult to tell from this photo, but this is a rather giant roll of straight pins. It measures about 5 inches across and the pins themselves are about an inch long. My friend didn't remember where she got it, or what it would have been used for. I have no clue either, but wonder if it wouldn't have fit into some sort of machine. Either way it's a fascinating piece! More, of what else but seams! Yes, there's more! That's what you get when I'm making three purses all at once. Hmmm - maybe it's going to be like the groundhog seeing his shadow?? Six more weeks of seams?? And, from Gypsy Rose Lee... "I have everything now that I had twenty years ago - except now it's all lower"
Today's quote, from Ann Landers: "To those who need encouragement, remember this: Beware of quitting too soon. Dr. Seuss' first children's book was rejected by 23 publishers. The 24th publisher sold 6 million copies"
Sure doesn't look like it! be getting a life lesson from a snake"
"All animals except man know that the principal business of life is to enjoy it" - Samuel Butler. will be able to get the general idea. make things to welcome the little one? This is a crocheted afghan - pattern is 'Snuggle Up' from 'Best of Terry Kimbrough Baby Afghans' published by Leisure Arts. Today's quote is by Don Herald..."Babies are such a nice way to start people". are you sick of this yet?? And from Betty Smith...."Look at everything as though you were seeing it either for the first or last time. Then your time on earth will be filled with glory." It's been yet another miserable snowy day here. Cleaned about 4" off the car this morning, and it's continued to snow the rest of the day. Enough, already!! I'm cryin' uncle (and aunts, cousins, inlaws, outlaws, and the neighbours!!). And, from Ann Landers.... "Know thyself. Don't accept your dog's admiration as conclusive evidence that you are wonderful". There are a few of the seam treatments I completed over the weekend. All of them are Pam Kellogg's designs - can you tell I love working them? Today's quote - "Do not worry; eat three square meals a day; say your prayers; be courteous to your creditors; keep your digestion good; exercise; go slow and easy. Maybe there are other things your special case requires to make you happy, but my friend, these I reckon will give you a good life." Abraham Lincoln. You just have to imagine all these sections joined together! The design was based on one I saw in the Summer 2012 issue of 'Sew Somerset' magazine, created by Trudi Sissons. This is what just arrived in my doorway!! Today's quote, by Ralph Waldo Emerson...."Our greatest glory is not in never failing, but in rising up every time we fail".